What’s the show? Hitori Bocchi no Marumaru Seikatsu, Episode 2. So how’s this episode? I love Bocchi! 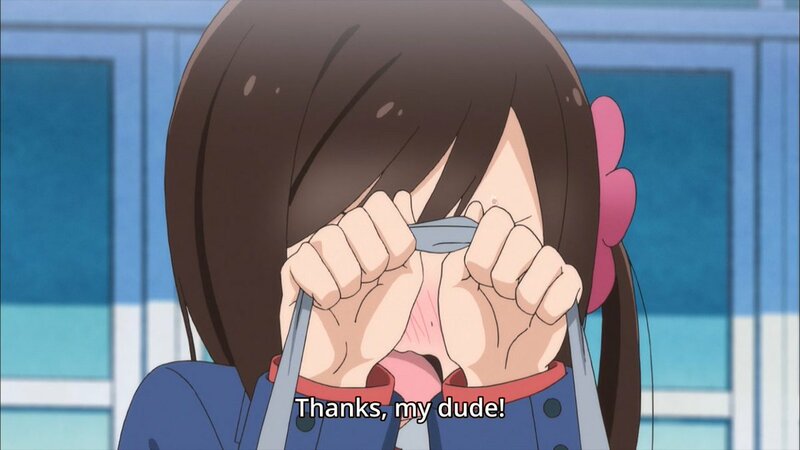 Bocchi is the best! It means a lot to people who have trouble initiating conversations, you know! Maybe you should take that as a sign that people aren’t that interested in reading episodic reviews for cute girl slice of life shows? Or maybe I should just double down on it and review it in excruciating detail every week! I’ll get people to notice Bocchi–or die trying! Why do I feel like this is going to be a weekly train-wreck? As opposed to all my other reviews that end up with me frantically pounding my fists on they keyboard at 2am? 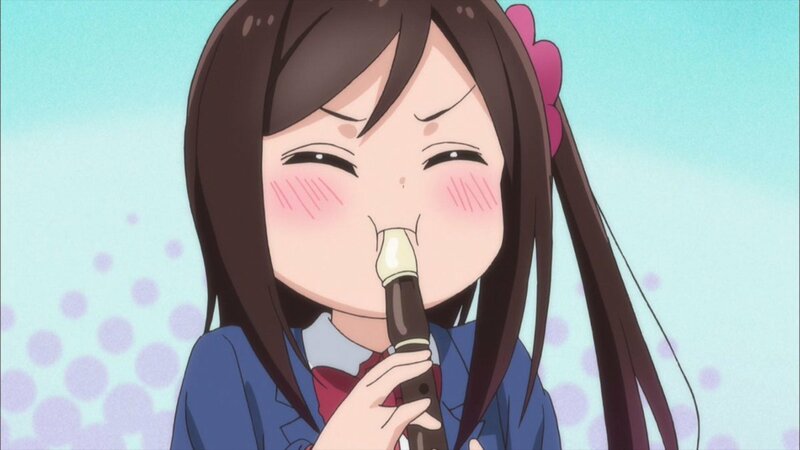 Bocchi randomly blowing her recorder is a big mood. I feel like we’ve diverted from the intended goal… what’s this episode about? Bocchi and her new friend Nako are having a fight–or rather Nako is made at Bocchi but because Bocchi possesses the social acuity of a moss-covered log she ends up having to turn to Aru Honsho–her class’ vice representative and all round suspiciously nice girl. After an excruciatingly long-winded (and hilarious) flashback sequence we see that Bocchi dropped the ball by saying she only started talking to Nako because of the promise she made to her elementary school friend to “make friends with all the kids in her class”. Thankfully Aru is their to mediate and they’re soon friends again. Phew, crisis averted! I know you’re being rude so I’ll chose to ignore you. 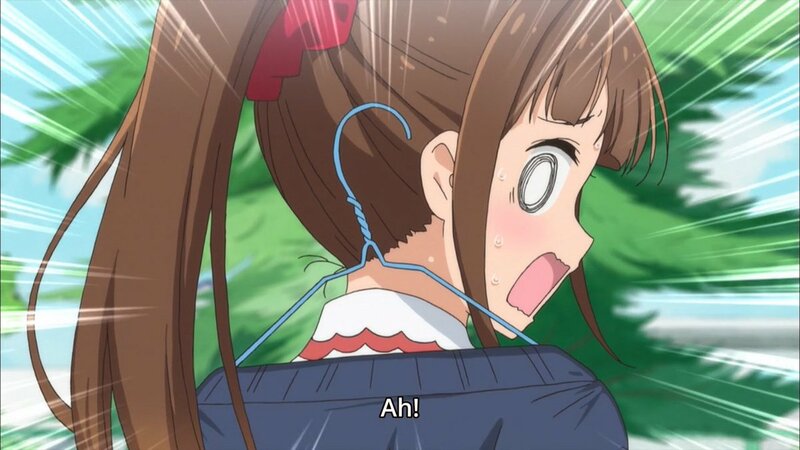 Anyway, some time after that they approach Aru one morning before school and Nako notices that Aru still has the coat hanger inside her sweater even though she’s wearing it and so proceeds to ‘quiz’ her on her life and overall behaviour. Turns out Aru isn’t the ‘little miss perfect’ she pretends to be and is in fact a pretty big loser or “unfortunate” as Nako labels her. 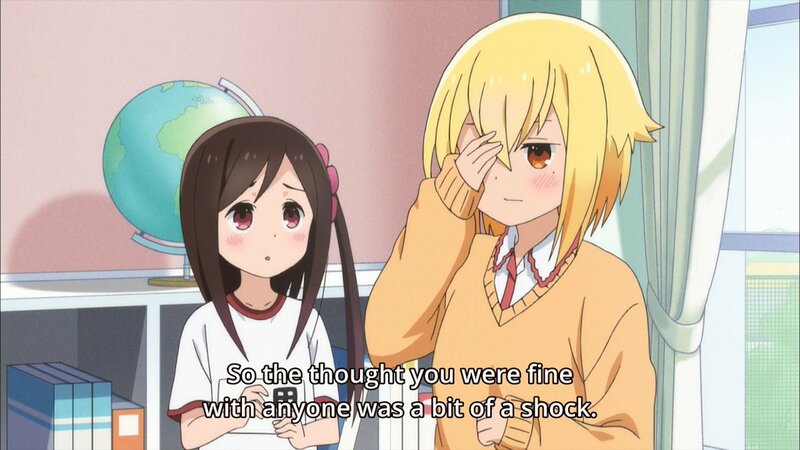 But she doesn’t do so maliciously, she’s just wanting to get the bottom of this girls’ character and have her be herself–something she warms to over the course of an awkward conversation (with most of said awkwardness coming from Bocchi’s constant mis-reading of the situation). And so what’s gained from this episode? It doesn’t sound like much happens? In the grand scheme of things, sure, not much happened. But for Bocchi these a big steps towards being able to function around other people and have conversations with friends that don’t result in reading cheat sheets or running away. 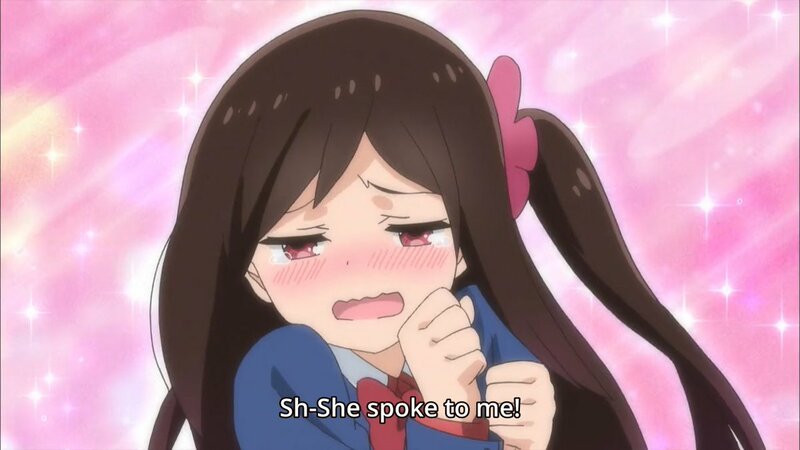 This is Bocchi’s journey and she’s gaining more allies along the way and did I mention I loved every minute of it? Yeah, I think you mentioned that once or twice… Well I’ll say it again, this show is adorable and wholesome and just makes me so happy! More please! Yes, finally someone who also watches this. Hmmm… Asperger’s? “On the spectrum” somewhere at the high functioning end?